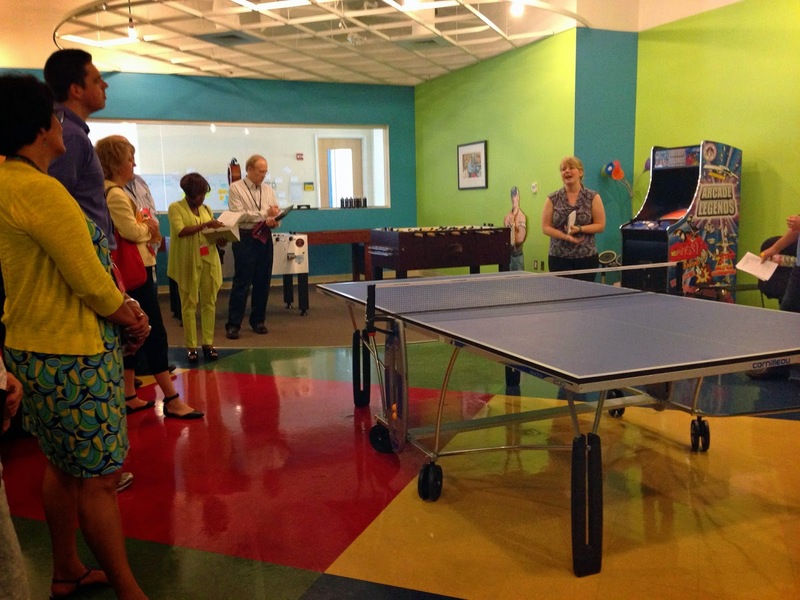 The first Friday of every month, the HR team at Motley Fool leads an office culture tour. Kay Noll at ASCO had taken it and found it interesting and thought provoking, so I went today along with the HR directors at five other associations. Sam Cicotello, Chief Rabble Rouser of the Highest Order, led our tour with admirable energy and foolish enthusiasm. I was just going to take it all in, but the geek in me won out and I took notes, so I figured I may as well share them. I know I’m stating the obvious here, but for the record -- this is my interpretation of what I heard and saw. Like everyone else, it was filtered through my own experiences. I’m sure I misunderstood some things or read too much into them. I just hope Sam won’t want to slap me if she reads this. The atmosphere was one of controlled chaos. All the furniture was on wheels and there was stuff everywhere -- a giant blow up shark, a pit of balls, walking desks, bike desks, giant tv screens and computer screens, white boards, Legos, books and fans. They evidently move and arrange it all depending on what they’re working on and whom they’re working with. They described their organizational chart like it’s just as fluid. As we walked around, we saw small groups of people collaborating everywhere. The Fools were welcoming and friendly and didn’t seem to mind us snapping pictures and asking questions. Because there are essentially no rules, their supervisors have to be very skilled at giving feedback and having what most of us would perceive as difficult conversations. I had hoped to gain some insight into how they achieve this. They said they focus on getting people that demonstrate these skills into supervisory roles more than training for them, but they clearly have a lot of support. They have between 10 and 20 staff doing HR work for a staff of 300. By comparison, we have 4 people to support 265. Here’s more of what impressed me. The crew at Motley Fool finds fun ways to communicate what’s important without relying on rules and policies. I honestly wouldn’t shed a tear if our employee handbook was burned, so this impressed the heck out of me. Pantsing wall (i.e., caught with your pants down.) If an employee leaves their computer left unlocked (FTC compliance issue), the finder sends an all staff email that’s embarrassing. In other companies you might be written-up or even fired for this, but Motley Fool finds the public humiliation effective. Fools errand. They pull a name out of a hat and the person selected takes two weeks off and is given some cash. They have no vacation policy and people can take whatever time they want, but this practice forces people to have contingency plans and back-ups. Obviously, an employee could be called away at any time and they don’t want to be left in a pickle. The Fool’s vacation/sick policy is pretty straightforward: take what you need. That’s right, as long as you get your work done and consult with your supervisor in advance (if you’re going to be sick, we’d like to know in advance, but we understand it doesn’t always work that way…unfortunately…), you may take any reasonable amount of time off. With pay, of course. Huh? Flexible paid time off? What’s the catch? Well… nothing, actually. Fools treat themselves, their company and their co-workers with fairness and respect, so you will not abuse such a wonderfully Foolish benefit. Performance Management – Measure everything and compete to win. At Motley Fool, they focus or their high performers. They suggested asking these questions: Who gets more feedback at your organization – high or low performers? Where do you spend your time? Where do you spend your money? Can you remove the low performers? Every six months each employee picks up to 10 people to get 360 feedback from. They are trying to move away from anonymous feedback and toward face-to-face. It’s not shared with them by a manager or anyone on their team. It’s delivered by what sounded like a group of trained volunteers and used for development purposes only. Performance management reviews are different every time. They use a 16 box performance vs potential grid. (See a traditional 9 box description from SHRM.) They don't force rank. Three times per year the leadership team discusses employees and where they are on the grid. They said approximately 10% of their staff are in the lowest quartile of the 16 quadrants at any point in time. They improve or they are put on a path to success somewhere else. If managers don't give good feedback, they take away supervisory responsibility. They want to play to people’s strengths, so they try to create multiple career paths to advance – some that don’t require supervision. Management isn’t the only way up at Motley Fool. Like I said, the atmosphere was one of controlled chaos and there were lots of options for people to chose from to do their work. 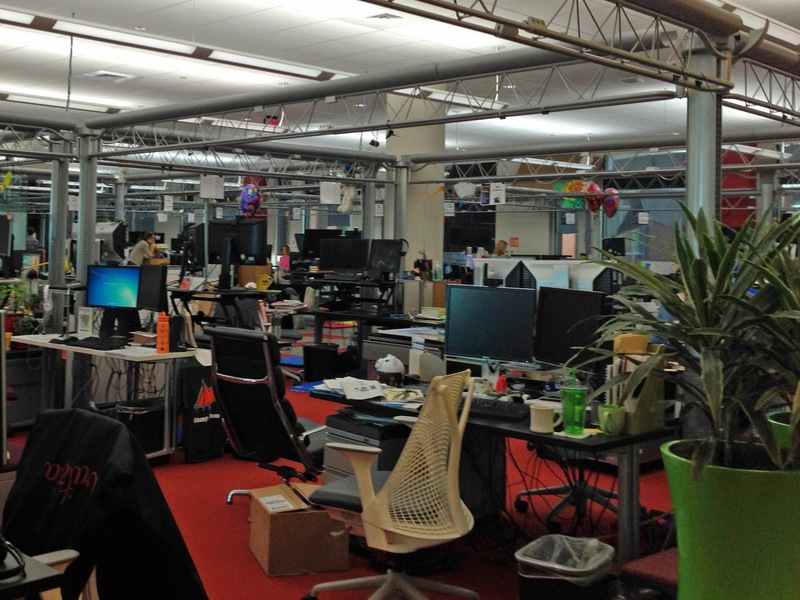 I saw treadmill desks, bike desks and standing desks. I didn’t see anyone using the bike desk or treadmill desk, but lots of people were using the standing desks. I’ve been looking for an adjustable, standing desk option for ASHA, so I honed right in on this. They use the Varidesk.com ($275-$350). We saw a quiet work room, a mommy room, a massage room, a reading/nap room and a cool game room. There was comfortable seating scattered around throughout the office. Oh, and how could I forget to mention this, there are no offices with walls. It’s all open space. I really liked the rolling white boards they had throughout the office (pictured above.) I could see us using those at ASHA. They could replace some of the flip charts I tend to drag around and become a sort of cubicle door for folks that want to work uninterrupted for a while. Collaborate — Do great things together. Innovate — Search for a better solution. Then top it! Fun — Revel in your work. Honest — Make us proud. Competitive — Play fair, play hard, play to win. Motley — Make Foolishness your own. Share your core value _____________. Are you living your core values? Will you hire for them? Will you fire for them? Are they present in your office? How frequently do you reference them? Are they part of your daily vocabulary/lexicon? They have pictures of every staff member on a wall across from their board room to serve as a reminder that the board is making real decisions that effect real people. This prompted me to think about collecting pictures of our members with brief bios and printing them on cards. We could give one to each staff member to remind us who we’re working for. Twice a year, they do an engagement survey. They’re using an app called Culture Amp which I plan to check out. They said they ask a lot of Gallup questions, but they do it themselves. Sam suggested thinking about what you want to fight and what you would be better off embracing. For example, they decided to embrace March Madness. They offer a bracketology class and everyone fills out their brackets, then they watch the games together. They seemed to have a few folks to facilitate learning on their people team. They mentioned just in time learning, but said they had a curriculum built for onboarding. They respond to requests and rely on internal resources as much as possible. They look for someone outside if they don’t have expertise in house. They mentioned looking at their high performing mangers to key in on what they do well, so they can figure out how to pass it down. The HR documentation type folks, which they described as compliance and benefits (Totally not how I would define benefits, but I understand.) report to finance not to the people team. Training, compensation, performance management, and recruiting folks are on the people team. They value staff being in their physical environment, but 15% of their staff work remotely. They have lots of flexibility, but no set telework schedules. They said they don't hire people to work remotely, but they have made arrangements to keep some high performers. Remote workers cannot have any direct reports. I didn’t learn much about how they compensate people. They mentioned a profit sharing type plan and being able to buy and sell shares. They also mentioned a bonus program with variable tiers (e.g., 5% and 10%), but said they all meet or miss the eligibility requirement together. They want people who invest and understand the ups and downs their customers feel, so they give all new employees $1,000 in their investment account. They said they want Fools for life and they want it to be a long life. They employ a full time wellness person. Generally, if Motley Fool pays for it, it should be healthy, but I think I saw a cake. I liked their well-stocked kitchen area. I’d be totally into an unlimited supply of Fage plain Greek yogurt. So, there you have it in probably my longest blog post ever. This probably goes without saying at this point, but I highly recommend taking the tour. Thanks to Kay for recommending it and thanks to my LAHRF colleagues for joining me.